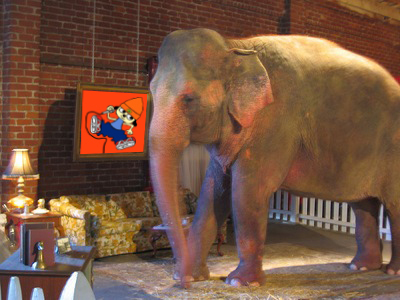 I am going to go straight off and address the elephant in the room. 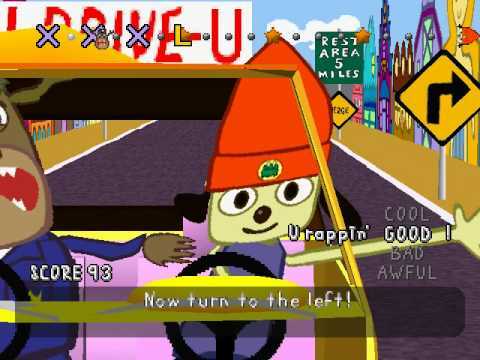 Parappa the Rapper is NOT a good game. It is a cult classic, so there are a fair few people who will defend it to the hilt. 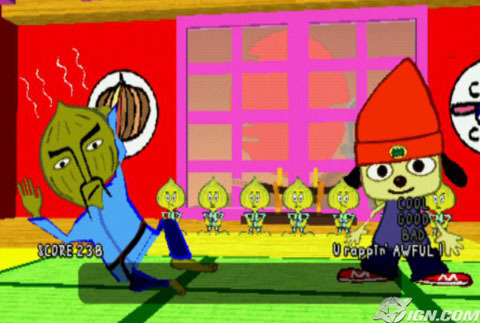 PaRappa the Rapper is the best game ever. There is nothing wrong with it, and it is totally unique. Now I assume the fanboys were distracted enough by the last section. So I’ll try to be more balanced. I’ll start with the “unique” comment, and you know what? It actually is. I don’t play a whole lot of J-Pop games so I have missed similar games. 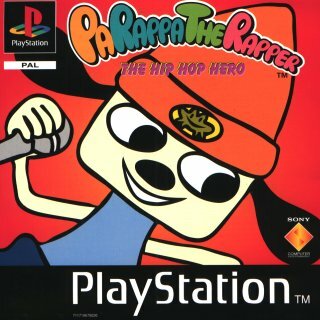 But to my knowledge and Wikipedia’s, PaRappa was the first rhythm game that achieved mainstream appeal, it is also the first “good” one. In 1997 Detroit, “PaRappa”, a young and unhappy blue collar worker from a poor family, struggles with various aspects of his life. 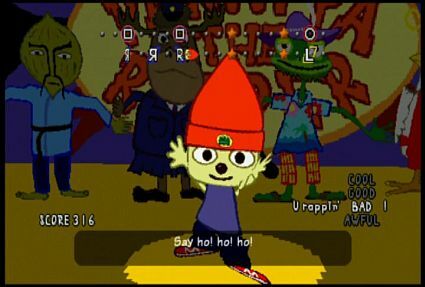 Although encouraged by his friends who hail him as a talented rap music artist, PaRappa’s future as a musician do not look promising, particularly after his lack of confidence causes him to panic during a rap battle one night at a club called The Shelter where he flees the stage. PaRappa works at a flea market, and through epic rap battling manages to sell a few extra items, and earns some extra cash. PaRappa comes to realize that his life has remained largely the same since high school. At first, he considers himself a victim of his circumstances and blames others for his problems. Over time, though, he begins to take more responsibility for the direction of his life. When he exhibits an improved attitude and performance at work, his supervisor grants him the extra shifts he requested. Hang on, the Moose is called Mooselini! Now, do you know why I stopped the car? Firstly, and it’s a very big one. Rhythm games from this era do not work on modern TVs. I couldn’t pay it on normal at all. I couldn’t keep in time with the rhythm, and would fail. It turns out, that due to the way digital TVs work, and the complicated processing involved, there is a slight lag between game and the screen. This doesn’t make a difference in most games, however, on a rhythm game, it can breaks it. It also might be the cause of my general suckitude in Mortal Kombat? (MK1, MK2, MK3) (Source 1– Game Trailers). (Source 2 – Edge Magazine). Secondly, it just isn’t a very good game. As I was only able to play on easy, the game ends after the 3rd level, so I haven’t completed it yet. Only getting 3 quarters of a game was common on older consoles and is a little annoying. You can watch the videos online of the other levels, but the game offers no variety. Each level is a different “Rap Battle”, and while the songs are light-hearted and fun, they get annoying after listening to it more than twice. I played the first level about 10 times on medium, and the song very quickly began to grate. As the gameplaying is press a buttons in order, it really is basic. In Guitar Hero you play along. Here you sit, and wait, then press 3-4 buttons (more on later levels). The game offers no skill, as even the “difficult” combinations are still simple, that anyone fairly coordinated will do. The game is also pretty short, on easy, I finished the first 3 levels in under 10 minutes. From watching videos, each level is around 3 minutes regardless. If you fail, you repeat, otherwise you progress at the end of the song. If you play on normal, and “freestyle”, which amounts to press a button twice instead of once to the beat, you get the “COOL” rating, if you get this on every level, you get the secret ending. 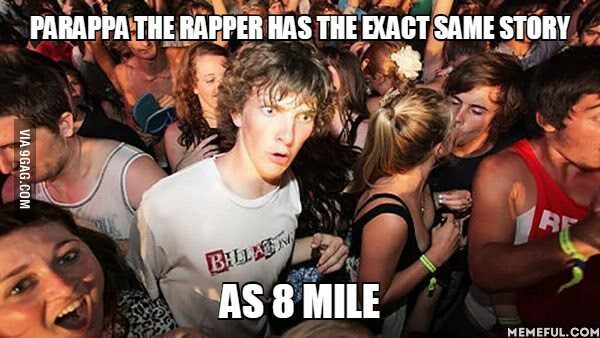 Final rap battle for the 8 Mile! My advice is, play the game on an old CRT monitor, if you fail, turn off, and come back an hour later. Cons: Short, music grates, boring. ‹ OPINION: GamerGate, and why I hate “Gamers”.